As senior New Media students, our senior capstone project entails a multidisciplinary group project to create an interactive exhibit at RIT's annual innovation and creativity festival, ImagineRIT. Our team consists of four interface designers, three developers, and one industrial designer. Our project, ambio, is a contemporary take on the classic mood ring. Our goal with this project was to naturally foster long-distant relationships, whether it be between a couple, a pair of siblings, or long-distance friends. Our aim was to recreate the ambient nature of those relationships where an empathetic keenness is present. Keep up with us at ambio.tech. Using modern biometric-tracking technology, we begin by collecting health data from the user through a wearable device. We then use that data to discern the wearer's current mood. Finally, we create a unique data visualization to share that mood with the wearer's paired users. We kept our branding fun and colorful, while remaining ambiguous enough to evoke interest in viewers. To advertise for our showcase at ImagineRIT, we hung up posters displaying mood examples. 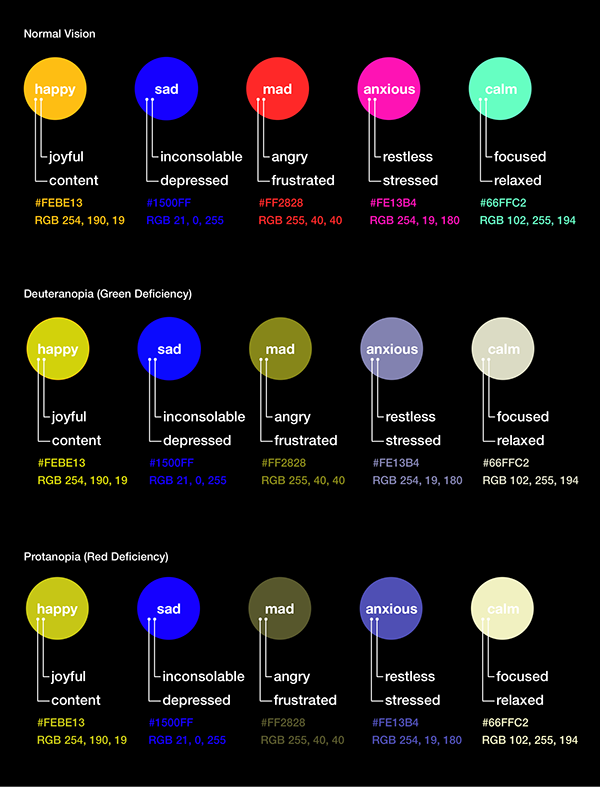 Since our project is based on colors that represent mood categories, it was crucial that our colors contrast in a way that was visible to all users, including those with color blindness. Our primary screens were created for phone and Apple watch screens. Our mobile application's home screen displays the user's partners' moods. When a user taps into a partner, the partner's time and weather are displayed. The user then has the option to message the partner, adjust the partner's sensitivity settings, or display the partner's mood on outside devices such as an AppleTV or Philips Hue light. 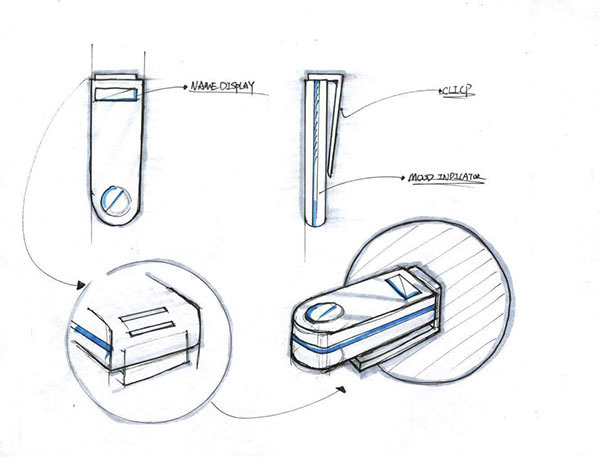 Our industrial designer, Vincent, created an accompanying wearable product for ambio. The wearable includes a screen to display partners' names, a clip to wear on clothes, and a strip of LEDs around the outer edge that glow different colors based on the partner's mood. 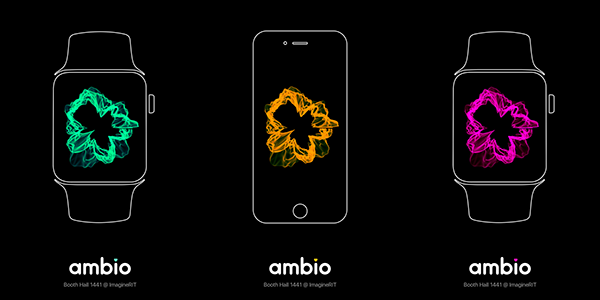 We showcased ambio at ImagineRIT in the form of an interactive trade show booth, for guests to see ambio in action with synced screens and demonstrative Apple watches. Ambio is a new take on the classic mood ring. We use the biometric tracking capabilities of wearables to interpret your mood and share them with your long-distance loved ones. 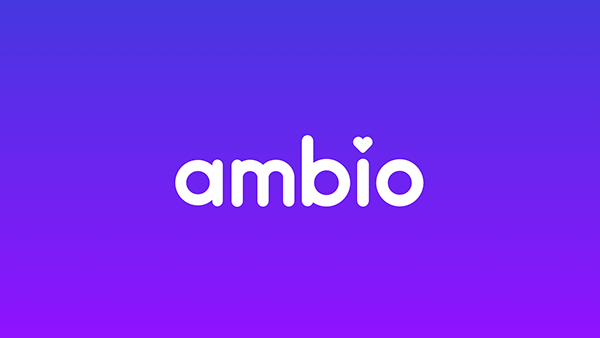 Ambio is closing the gap in modern digital communication.